Assign admin roles in Office 365 for business. As the person who purchased your Office 365 business subscription, you are the global administrator. This means you have complete control over the Office 365 suite of products. To help you manage Office 365 for your business, you can assign users to administrator roles so they can perform tasks in the Office 365 admin center. For example, if you want help resetting passwords, you can assign someone to the Password administrator role. 1. Go to the Office 365 admin center. 2. In the Admin center, select Users. 3. On the Active users page, choose the user whose administrator role you want to change. The properties page for the user opens. 4. Next to Roles, choose Edit. If you don't see the Edit button, then you don't have global admin permissions and can't assign admin roles to other people. Ask a global admin in your business to assign roles for you. In a small business, the business owner (the person who purchased Office 365) is a global admin. In a large business, key people in the IT department are global admins. 5. Choose the Edit button next to Roles. 6. Choose Customized administrator to see a list of roles we've customized for you. Office 365 comes with a set of admin roles that you can assign to users in your organization. Each admin role maps to common business functions, and gives people in your organization permissions to do specific tasks in the Office 365 admin center. Here are the available roles and what people assigned to them can do. Accesses all administrative features in the Office 365 suite of services in your plan, including Skype for Business. By default the person who signs up to buy Office 365 becomes a global admin. Global admins are the only admins who can assign other admin roles. You can have more than one global admin in your organization. As a best practice we recommend that only a few people in your company have this role. It reduces the risk to your business. Tip: Make sure everyone who is a global admin in your organization has a mobile phone number and alternate email address in their contact info. Makes purchases, manages subscriptions, manages support tickets, and monitors service health. Manages mailboxes and anti-spam policies for your business, using the Exchange admin center. Can view all the activity reports in the Office 365 admin center. Someone with BOTH the Exchange admin role and the user management role can create and manage Office 365 groups in the Office 365 admin center. Manages file storage for your organization in SharePoint Online and OneDrive. They do this in the SharePoint admin center. They can also assign other people to be site collection administrators and term store administrators. Permissions assigned to SharePoint sites are completely separate from the Office 365 global admin role. You can be a global admin without access to a SharePoint site if you weren't added to it or didn't create the site. People in this role can also can view all the activity reports in the Office 365 admin center. Resets passwords, manages support tickets, and monitors service health. Password admins are limited to resetting passwords for users. Configures Skype for Business for your organization and can view all the activity reports in the Office 365 admin center. Opens support tickets with Microsoft, and views the service dashboard and message center. They have “view only” permissions except for opening support tickets and reading them. Tip: People who are assigned to the Exchange Online, SharePoint Online, and Skype for Business admin roles should also be assigned to the Service admin role. This way they can see important information in the Office 365 admin center, such as the health of the service, and change and release notifications. 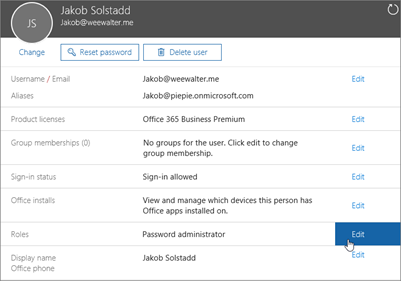 Resets passwords, monitors service health, adds and deletes user accounts, manages support tickets, adds and removes members from Office 365 groups. The user management admin can’t delete a global admin, create other admin roles, or reset passwords for global, billing, Exchange, SharePoint, Compliance and Skype for Business admins. Can view all the activity reports in the Office 365 admin center and any reports exposed through the reporting APIs. If you have an Office 365 E3 or E5 business subscription, it includes security and compliance tools. In that case, you have access to these additional roles: Compliance administrator, eDiscovery Manager, Organization management, Reviewer, Security Administrator, Security Reader, Service Assurance User, Supervisory Review. When a person is assigned to the Office 365 global administrator role, they are automatically assigned to the System Administrator security role in Dynamics 365 (online). A person assigned to the System Administrator security role in Dynamics 365 can assign other people to Dynamics 365 security roles. With the System Administrator security role, you can manage all aspects of Dynamics 365. Use this new role to assign users to manage Dynamics 365 at the tenant level without having to assign the more powerful Office 365 global admin privileges. A Dynamics 365 service admin can sign in to the Dynamics 365 admin center to manage instances. A person with this role cannot do functions restricted to the Office 365 global admin such as manage user accounts, manage subscriptions, access settings for Office 365 apps like Exchange or SharePoint. A person assigned to the Power BI admin role will have access to Office 365 Power BI usage metrics. They'll also be able to control your organization's usage of Power BI features.